In a time when whiskey brands are vying for a share of the brown spirits pie (ie, your hard-earned money), there are tons of new releases that come out. While the folks at Clyde May’s fit into that first category, I’m happy to say their new Straight Bourbon is just what the doctor ordered. Originally, we were introduced to Alabama-style whiskey with their 85 proof whiskey. I’ll be honest, I didn’t have a lot of high hopes. Apples in whiskey? I was thinking that either it was going to be sweeter than I prefer, or I wouldn’t taste the apples (nor their influence) at all. Maybe it’s because the apples are dried, or they’ve found the just-right amount of them, but it’s a nice balance of sweet and apple flavor. If you’ve tried other apple flavored stuff, this is different – not artificial, and surprisingly easy to drink. The new releases fit into that high proof category I mentioned, the first being Straight Bourbon. A quick lesson, to be called straight bourbon/whiskey/rye, it has to be at least 2 years old. 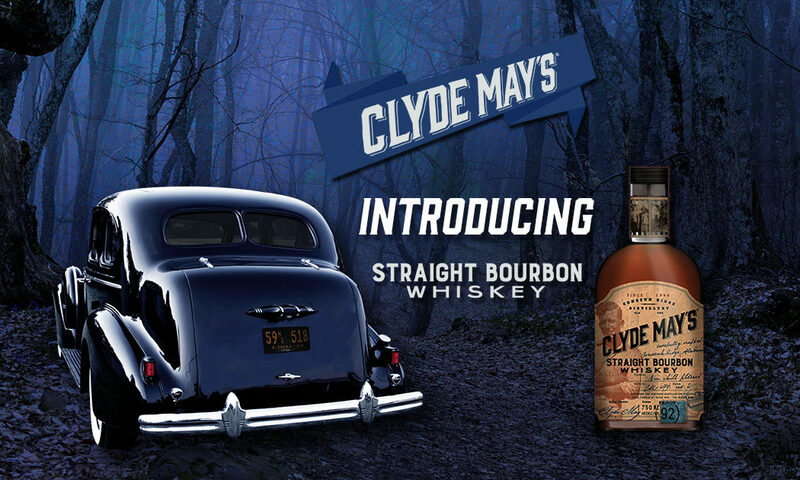 Clyde May’s more than meets that with their 5 year old, non-chill filtered offering. By not filtering it, I’m thinking that leaves more of that apple taste behind. After all, a dried apple doesn’t have any juice, so it’s whatever the whiskey can pull from the dried flesh. Their second new release is an 8 year old cask strength. That means it goes right from the barrel into the bottle. When I was distilling, one of my favorite things to do was to dump a barrel of whiskey. There’s no smell like it! And it also made me a bit particular about the strength of my whiskey. I prefer cask, so I can add the amount of water that I want, for my tastes. Some days that’s more than others, but that’s OK. It’s my whiskey. Ice? Sure, if you want. Try one large cube instead of a bunch of little ones. The nice folks at Clyde May’s did send me a bottle of the Straight Bourbon. I’ve tried it a variety of ways – (calling it research, yes I am): straight, a little ice, mixed with Barritt’s ginger beer. This is the bottle I wanted when I first received the 85 proof release. That extra 3.5% ABV turns it from a good whiskey to a really good whiskey. It’s still smooth, but there’s tons more flavor and only a little more burn. Here are the particulars, I’d definitely suggest finding a bottle! Sláinte! Nose: Fairly sweet, with caramel corn front and center. A little burn, but I’d expect at least a little from a 92 proof whiskey. Taste: The same caramel and corn notes follow through, with that hint of apple on the finish. The burn is still there, but the finish is short and only a little sweet. Other comments: one thing I noticed immediately was the new label. It’s a die-cut (meaning, not just a straight across square), plus it’s embossed. Lots of info on it, too – it makes an interesting looking bottle on your bar. Quick notes on the Cask Strength: it was released on October 1, but only 3,000 bottles were made. At a price of $89.99 it may be worth looking for, given the taste of the Straight.